Some website developers prefer to resize the browser window of the visitors, without their permission, to display their own creativity in terms of flash, presentations and other graphics in either a full screen window or a browser window size that best displays what they have created. These developers either just do not know that it annoys most of the visitors, me included, or may be they never gave it a thought. Its impact on a business is even more, when a designer does something similar with their site or presentation, it ends up annoying the visitor who could also have been a potential customer and drives them away from the site. If you are a wanna-be web designer, already established or an experienced designer, I put forward a list of reasons which tells you in clear terms that you should not follow this practice, give it a thought and you may agree with me if you think from a visitor’s point of view. It’s annoying – You may have never asked people who visit your or your client’s website but you should know that many people don’t like their browser window being resized without their consent. Increased screen resolution – Gone are those days when people used to have 640×480 or a maximum of 800×600 screen resolution. Computers have become a lot more cheaper now and that also includes monitor. Screen resolutions have increased and on an average over 90% of computers use anything over 1024×768 pixels resolution. It’s not your browser – It’s your visitor’s browser, not yours! Period! If you can not help it and must resize the browser window because you want to show them a very large drawing picture or a design of some mechanical instrument, first display a notice to let them know and only after they click on it you should change the browser window size. Makes sense? You’ll lose visitors – Visitors don’t like to see their browser window getting resized without any notice, they might end up closing your site and never want to come back again. The immediate challenge for smaller web design companies is how to attract new business and keep old clients in a downturn economy. Customers are falling off of maintenance contracts and smaller businesses may not be looking to start a website right away. Enterprise level clients are becoming more price-conscious. What can we do to make sure our collective heads stay above water in this tough climate? Here are 10 tips to survive the economic downturn. Some businesses are actually afraid to contact their clients in a downturn because they don’t want to be the next casualty on their cost-cutting lists. If someone is going to jump the boat, they’re going to do it anyway and a phone call from you may actually stop them from leaving rather than encouraging them. Call your past clients up, ask how their businesses are doing and ask them if you can help them out with anything that they may be considering on the web front. Reinforce that your business is stable and you’ll be there for them. When your potential clients sit down and plug in the math to justify an in-house designer versus an outsourced designer, the outsourced one will win every time. No employment premiums, no benefits and no major ongoing costs once the project is done. If they are relying on in-house staff in other roles to maintain the website, chances are good that updates aren’t being done on time if at all. Your services don’t cost your customers money, they save them money in the long run. If you are noticing a lot of clients dropping off your roster and not a significant amount of new business, reevaluate your pricing plans and packages. Are they clear? Do they fall in line with what other web design companies are charging in your area? A quick market survey of other businesses in your area will tell you what you need to know. While you should never compete on price, you should check once in a while just to make sure that your pricing isn’t way out of line with the competition. Don’t make your pricing the lowest on the block either. You don’t want the clients that are looking for the cheapest game out there. Somewhere in the middle is where you want to be in order to attract clients and still make money. It is just as important to make sure that you are making money as it is to ensure that your services are priced in line with the market. This rate calculator is an excellent gauge of how much you should personally be making based on your expenses. If you aren’t there yet, or don’t think you will be there at your current rates, it’s time to reevaluate. We can all agree that add-ons are a great moneymaker regardless of economic times. Make sure that you add services that you know you can provide; for example, you don’t want to turn yourself into a web hosting service if you only have very basic knowledge of web hosting. Client pressure can often push us into business decisions like this that we just aren’t ready for. Outsource anything that you aren’t 100% comfortable with. This is the time to consider adding social media to your roster. You can read more about it in our article here. Not only will your message be dated when there is an upswing, this kind of marketing just reinforces the “don’t buy anything” reflex that businesses have during economic downturns. People who want web design services base their buying decision on a combination of reputation, service, and price. Throwing extra concerns in just confuses the message. Smaller businesses that aren’t financially viable to start with are the first casualties in a downturn. You have to retool your model to go after, and keep, larger customers. Designing a site for a mid-sized company is the same as doing a site for a small business, with only some minor exceptions. Upper management requires metrics to show the performance of the site, an easy enough thing to do since most of you are already set up with web analytics programs. Include the fact that you have reporting tools in your marketing message and larger companies will jump on board. Keep in mind that larger companies will require more of your time in the design process than smaller companies and quote accordingly. Ask the company to appoint a project manager to deal with your company during site creation and maintenance so that their message isn’t diluted by various stakeholders. This way you spend less time defending project decisions and more time designing. Competition between web design businesses is usually friendly. Call up a bunch of web design companies in your area and see if you can help each other out. You may have Flash skills that another company can hire you for. They may have more SEO experience than you do and they may be able to handle your SEO requests. Just make sure that you bring something to the table so that the references aren’t all one-way. Make a list of the stuff that you currently pay for that isn’t 100% necessary for your business. Ongoing costs like magazine subscriptions should be the first on the chopping block. After them, focus on items that save you money and help the environment, like going with a printer cartridge recycling service instead of buying new cartridges. Reducing staff should be a measure that you only take if you think your business is in serious trouble. While layoffs may be the order of the day for large businesses, smaller web design businesses should be focused on reassuring their staff and contractors that there will be continuing work for them. Talk to them and see if they want to work different hours, take classes to upgrade their skills or anything else. While you probably can’t offer huge raises right now, flexible hours and free courses are great incentives for your staff that will keep them happy and working hard for you. If you are the only “staff” at your business, don’t forget to take some time off yourself. A lot of web designers are in “panic mode” right now, trying to get as much work as they can. When you take on too much, your efforts are diluted and the quality of your work suffers. There are a million small things that you can do to save money and stay viable in an economic downturn. The most important thing that you can do is use this opportunity to develop good business habits, like paying attention to customer retention and keeping your expenses lean. The things that you can do to help yourself and others out during a recession are usually the things that you should be doing in business all along – it’s just easy to forget about them when times are good. Typically, there are two main ways of debugging server-side code: you can utilize an Integrated Development Environment (IDE) with a built-in debugger or log and perform your debugging processes in a web browser. This article shares an elegant, simple, and more maintainable way of debugging Ajax apps via the web browser (more specifically for the Mozilla Firefox browser). You’ll learn the basics of leveraging Firefox in conjunction with Firebug and FirePHP to implement FirePHP libraries on web apps and logging messages in the Firebug console. When Ajax techniques became popular, developers faced a new problem: how can we debug Ajax requests and responses efficiently for complex web applications? If using a debugger was hard enough with the RESTful model, triggering an Ajax-specific request is a pain and a bit more difficult; dumping logs and information pertaining to those Ajax operations had to be done using JSON or XML. This is where FirePHP helps, allowing you to log your debugging messages to the Firebug console. FirePHP doesn’t mess with your code (and it doesn’t require you to modify anything to trap errors): the messages you print are sent to the browser in the HTTP response headers, which is great when you’re using JSON or XML since it won’t break their encoding. This makes FirePHP ideal not only for debugging your Ajax requests, but also your entire PHP codebase. FirePHP is an add-on for an add-on: it extends the popular in-browser web development tool called Firebug with an API for PHP web application developers. FirePHP is free and easily attainable via the Mozilla Add-Ons section on the official Mozilla site. The official FirePHP site can be found via this web address: www.firephp.org. Christoph Dorn is the person responsible for creating FirePHP. If you don’t have all of the above applications installed on your machine, click on their link to learn about how to download them for your particular system. Installation of the three things above is a straightforward process. FirePHP can be a little tricky to install if you’ve just recently started learning about web development, but there’s good documentation out there about it. This article is about using FirePHP, so I’ll let you handle the installation part (though feel free to ask in the comments – we’d be happy to help if you encounter issues). Because the information is sent to Firebug in the HTTP Headers, you should activate the output buffering or you might get the "headers already sent error". It may sound complicated, but all you have to do is write ob_start() on the first line of your PHP script that you’re debugging. You have to disable FirePHP when the site goes live or you will risk exposing sensitive information to anyone that has Firebug/FirePHP installed (we’ll talk about how to do this later down the article). And then just a general tip for Firebug/FirePHP users: it’s also a good idea to disable or suspend Firebug and FirePHP when you’re just browsing the web because they can really slow down some websites and web applications (such as Gmail, for example). This is the fun part where we start logging messages and reviewing the basic logging functions. One thing to note is that, just like PHP, which (at least for PHP4 and PHP5) is a "pseudo object-oriented" language, you can use FirePHP in a procedural or object-oriented (abbreviated OO from now on) manner. I prefer the object-oriented techniques and I encourage you to use the same pattern as it is considered the most popular and most modern approach to building apps. The OO API allows you to instantiate a Firebug object to use it or to call its static methods directly. I’m a lazy guy and because static methods are more terse and require less typing, that’s what I use. In your script, you can use the following code block to create the FirePHP object ($firephp). This is the format for calling static methods in your scripts. We will not get into any detail about the benefits and coding style of each API, I’ve included them here only so you see what options are available for you. In other words, I don’t want to start a flame war about which procedure is better – it’s up to you to decide and I’ve noted my preference. Let’s talk about logging messages in the Firebug console (remember, this will only work if you’ve configured your app for FirePHP). If you are ad-hoc debugging a bug, the following examples are what you’ll be interested in utilizing. Tip: when you hover your mouse on logged variables in the Firebug console, an info window will appear in the web page containing all of its elements. It’s a nifty feature, don’t you agree? Here is an example of logging information messages using the info method. Here is an example of logging a warning message. Here is an example of logging a warning message using the info method. When your site goes live, you can (and should) disable FirePHP logging. Call the following line of code on the first lines of your script. What’s great about this is that you can leave all of your FirePHP code in your scripts for later use – just pass either true or false when you want to turn logging on or off. If your application uses a "config file" to keep track of global settings, it is advisable to set a configuration option to enable or disable it. First, here’s a screen capture showing all of our messages in Firebug all at once (I ran it sequentially). In this article, we covered the very basics of using FirePHP to help you debug and gain information about your PHP/Ajax applications easier and through the web browser. I hope that this results in you becoming convinced that you should explore your debugging options outside of "old-school" techniques such as using echo or print on top of your web page layout to see what a variable or array contains. Using FirePHP is so easy and convenient, and gives you much more options and data for debugging purposes. In a future article, I’ll be covering more complex features of FirePHP and using Firebug to make this simple debugging tool a more robust and fully-featured logging framework. Social media is the current rage of all geek and non-geek internet users, where geeks can play online games on social networking sites too. Facebook, Twitter, Reddit, Digg, Friendfeed, MySpace and other popular social media have interesting unique logos, which have now inspired some interesting Social Media Icons Pillow designs! Social Media Icons pillow will surely make geeks feel at home and provide some relaxation, quite similar to the way social networking sites make people feel at home in their own online world with friends. Most geeks are no longer unsocial beings; they do have a virtual social world. They network a lot on social media and have hundreds of friends. These pillows are ideal for geek homes – a place where real and virtual world always meet and co-exist. One can rest on these pillows after a long tiring day of games, work, social networking and think about next scribble on the Facebook wall or listen to some music streaming in from MySpace or can simply Tweet away! These pillows are available at Etsy Craftsquatch for $14.99 -19.99 per pillow. The colors and logo designs look quite artistic too. These logo designs too were created by creative talented geeks and they really look nice on pillows too. There is also other Soft RSS Icon Pillow, Mac Keys inspired pillows and even Adobe CS3 icons pillows for tired geeks. Today, the cool guys over at Obox Design introduced their new line of professional WordPress themes called “The Obox Signature Series”. Thanks to David and Marc, we will be giving away a total of 10 copies of the “Arcade” and “Left Handed” themes (single user license). All themes are packaged with OCMX-Live, a powerful add-on to the WordPress backend which allows you to control and customize many of the elements of your theme. To participate in this great competition, simply follow @oboxthemes and leave a comment below with your Twitter username and anything else you’d like to say about these awesome themes. “Arcade” is a great WordPress theme inspired by Martijn van Dam who creates some incredible designs. 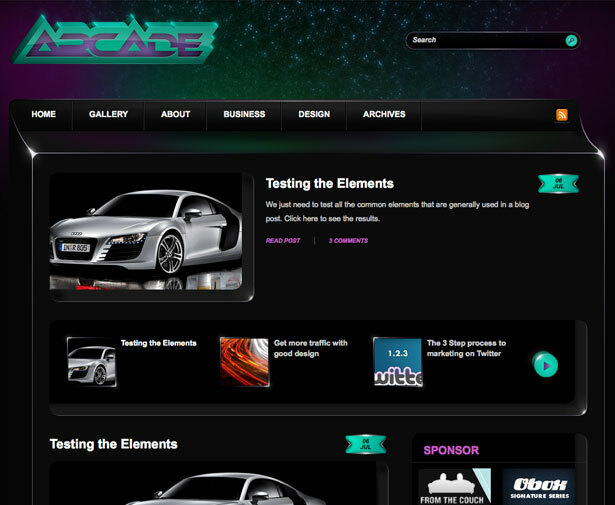 The theme is perfectly suited for gamers or sci-fi subjects with a touch of retro design. Left Handed is perfect for those who have an art orientated blog and don’t want to be left in the field with just another blog template. This theme will impress your readers with its attention to detail in the custom hand drawn fonts and comment sections. All winners will receive a full year of support for their new theme for free. For more info you can visit the Obox Design website where you can view their full theme collection and more details on support and pricing. Once again, in order to participate in this great competition, simply follow @oboxthemes and leave a comment below with your Twitter username and anything else you’d like to say about the themes. If you are working alone, chances are that you have a hard time to get a honest feedback from other professionals. Concept Feedback is here for that, it’s a social network for designers that allows you to upload some design you are working on to get a feedback from other designers. They can vote on the design and leave a review of the design, then other members can rate these reviews and discuss them. The website is quite straightforward and useful, and so far it seems that people using it are designers, so why don’t you give it a try? I come from a print background of 9+ years. The last 4-5 I have been designing for the web. I have been following these 10 amazing designers that have influenced and taught me plenty through their books, websites & even recent portfolios. I asked around for other designers opinions of whom their favorite’s were and realized the choices were pretty close if not the same. I chose to feature a little bit about each one and show some work they have done. I think the following designers have influenced and shaped the way we (younger designers) think today. Jason Santa Maria is a Graphic Designer living in sunny Brooklyn, NY. He serves as Creative Director for Happy Cog Studios, both in New York and Philadelphia. This status grants him access to most black-tie galas and groundbreaking ceremonies. Recognized as one of the industry’s most balanced new media designers, Cameron Moll is proficient in functional web design, clean markup, and savvy print design. Cameron has been involved in the design and redesign of scores of websites, and his influential techniques have found favor in circles across the web. He was a contributing author for the book, “CSS Mastery”. Cameron’s work has been recognized by respected organizations such as National Public Radio (NPR), Communication Arts, and Veer. His personal site, CameronMoll.com, delivers design how-to in the form of engaging conversation, on-topic banter, and downloadable artwork source files. Jeffrey Zeldman was one of the first designers, bloggers, and independent publishers on the web, and one of the first web design teachers. In 1998, he co-founded—and from 1999 to 2002 he directed—The Web Standards Project, a grassroots coalition that helped bring standards to our browsers. He publishes A List Apart “for people who make websites;” has written two books (notably the foundational web standards text, Designing With Web Standards, 2nd Edition); co-founded the web design conference An Event Apart; and founded and is executive creative director of Happy Cog™, an agency of web design and user experience specialists. Dan Cederholm is a web designer and author living in Salem, Massachusetts. He’s the Founder and Principal of SimpleBits, LLC, a tiny web design studio. A recognized expert in the field of standards-based web design, Dan has worked with Google, MTV, AIGA, ESPN, Blogger, Fast Company, Inc.com, and others. With each new project, comes an opportunity to minimize markup and embrace the flexibility of CSS. Dan co-founded Cork’d, a social network and reviewing application for wine aficionados, and launched IconShoppe, a storefront for stock web icons hand-crafted by SimpleBits. He is the author of two popular books: Bulletproof Web Design (New Riders, 2005) and Web Standards Solutions (Friends of ED, 2004). Dan also runs the popular weblog SimpleBits, where he writes articles and commentary on the web, technology and life. An interactive designer, living the heart of Philadelphia, PA. To me, being a designer doesn’t just mean I make pretty pictures (although I can do that too); it’s about conceptually and visually helping to solve people’s problems. Professionally, my passion is generating ideas, theories that haven’t been explored yet. Technically, I specialize in Flash, XHTML, CSS, and typography. Andy was making web sites for food when the dinosaurs roamed the earth. These days, he pretends to work hard as Creative Director at Stuff and Nonsense, but according to his wife he actually has rather an easy life. In his spare time he dreams of having a misspent youth and blogs at For A Beautiful Web. Shaun Inman is a successful designer and developer living and working out of Chattanooga, Tennessee. Originally from Norwood, Massachusetts, he studied Graphic Design at the Savannah College of Art & Design after which he spent a few years in Baltimore, Maryland. His interest in design gradually shifted to web design and development thanks to many well-documented open-source and standards-based technologies. Dave is a graphic designer for his own Bright Creative in Vancouver. He’s the creator and cultivator of the highly influential css Zen Garden, as well as being a member of the Web Standards Project. Dave writes about all things web for his daily weblog. Andy works as senior web designer for Message Digital Design Ltd. In his spare time he runs SkillSwap.org, a project that provides FREE training for his local new media community. He also occasionally posts to his blog. .Eric is an internationally recognized expert on the subjects of HTML, CSS, and Web standards. A widely read author and sought-after speaker, he is the founder of Complex Spiral Consulting, a company that aims to help clients save money and increase efficiency through the use of standards-oriented Web design techniques. Google Chrome OS: Web Developers Rule! Google is getting into the operating system business (again) with Google Chrome OS. Palm put WebKit at the heart of a device with webOS, the Crunchpad talked about it for the netbook, and there have long been desktop-boot-to-browser devices out there. This is great news for Web developers of course. The Web as a platform continues to push outwards, and we can use our skills to reach more and more folks out there. There is a reason that we won’t see the fruit of this labour for awhile though, and that is because there is a ton of work to be done. I am excited to see us all come together to push the Open Web platform further and get to a point where it can do everything we need to create compelling user experiences! Google now has two competing open source in-house Linux-based operating systems with Webkit browsers. This won’t end well. Scott Jehl has released jQuery Visualize, the plugin that groks HTML tables and generates lovely charts from it, all from a simple $('table').visualize(); (lot’s of options for you to twiddle too if you want). …repetitive rows removed for brevity.